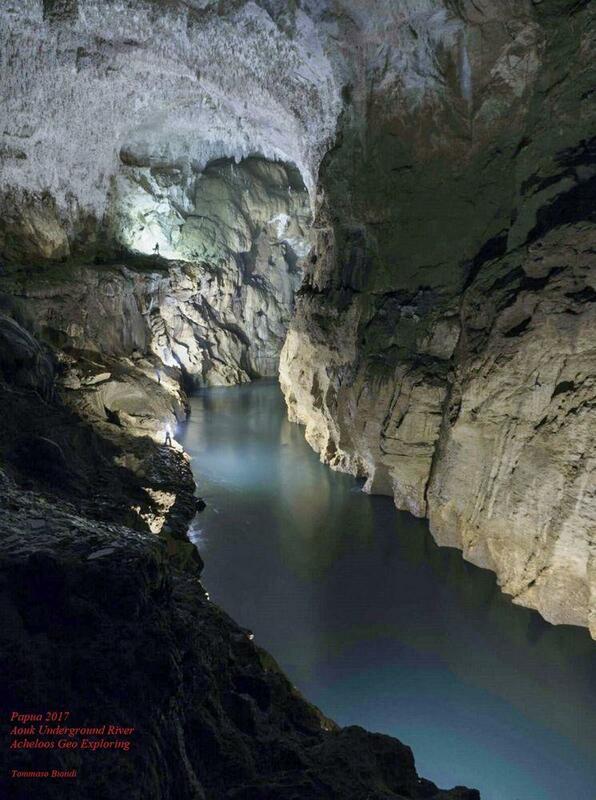 There are a lot more underground rivers in the world than most people imagine. 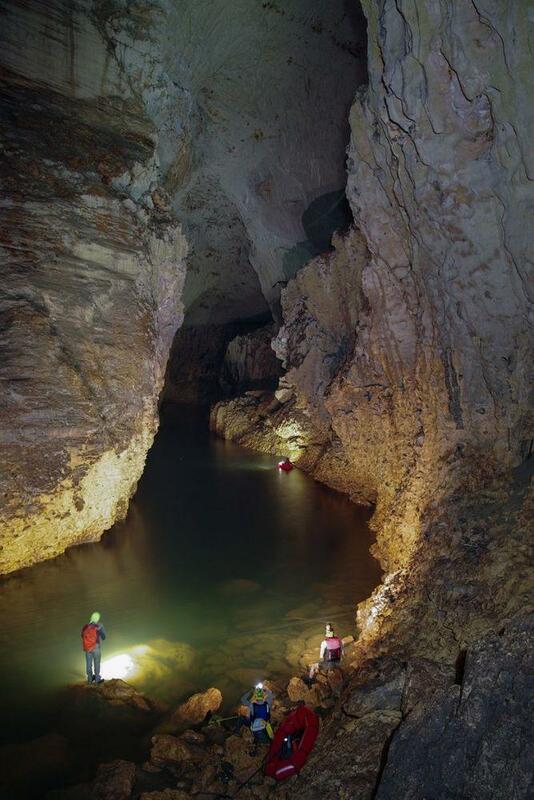 One of the largest and most impressive is Aouk Underground River in a remote area of New Guinea. The “head” – western extension of New Guinea island has a suitable name (from the viewpoint of a map viewer) – Bird’s Head peninsula or if used Dutch toponym – Vogelkop. The southern part of the peninsula is lowland area but in the north are two impressive mountain chains: Arfak Mountains and Tamrau Mountains. Most of the peninsula is covered with pristine rainforest and most of its area is sparsely populated and seldom visited by travelers and scientists. Nevertheless, the civilization step by step is coming to this land – unfortunately, by cutting the beautiful forest and dividing it by new roads. Local people step by step change their way of life – we are not the only ones who want to live in houses with electricity, drive cars and go to schools. Nevertheless, for the most part, this still is a wild and pristine country. Rain forest needs rain – and Bird’s Head peninsula has lots of it. Southern slopes of Tamrau mountains get even more rain than the rest of peninsula – at least 6 meters per year. Thus, even if peninsula is not very large, here have formed many powerful rivers. The ground south from Tamrau mountains – Ayamaru Plateau – is covered with a thick layer of limestone. 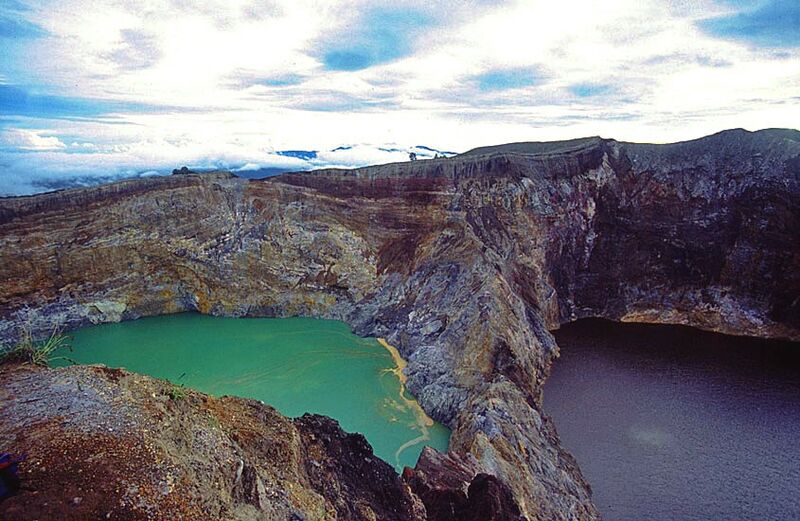 Add to this rich rainfall and equatorial climate and – yes, in such places nature creates caves, sinkholes, and other interesting karst formations. Even superficial browsing of satellite images in Google Earth shows that quite a few rivers in Ayamaru Plateau disappear under mountain ridges and reappear in the other side. If these rivers are seen even on satellite images through the thick canopy of rainforest – these should be fairly large streams which should form enormous caves. One of these streams is the approximately 250 km long Aouk River (in lover reaches called Kladuk or Keladoet) which has several such underground sections. This river collects water from more than 4000 km2 large area and in its lower reaches has a discharge of 300 m3/s – some five times more than, for example, Thames River. Of course, locals noticed this subterranean river long ago. Scientists and researchers of modern times though came much, much later. The first known European in this area was Italian researcher Odoardo Beccari in 1873 – 1875, but later many researchers of European origin have been here. But, as far it is known, no one tried to research the underground sections of the river. Until 2012. Around 1999 there was formed Acheloos Geo Exploring – a group of venturesome Italian explorers. Acheloos Geo Exploring has enthusiastically explored natural wonders, human traditions, and history in diverse remote and less remote areas of Earth – such as Laos, Honduras, Haiti, Indonesia, deserts of North Africa and, of course, Italy. One of their specialties is cave diving – one of the technically most complex and risky kinds of exploration. The first expedition to Bird’s Head peninsula of Acheloos Geo Exploring took place in 2016 under the framework of a project “Call for River” – the available materials promised a find of one of the world’s largest underground rivers here. The findings were promising and followed the second expedition on December 17, 2017 – January 23, 2018. This description refers to the underground part of Aouk River which is located in the sparsely inhabited area in the southern part of Tambrauw Regency. 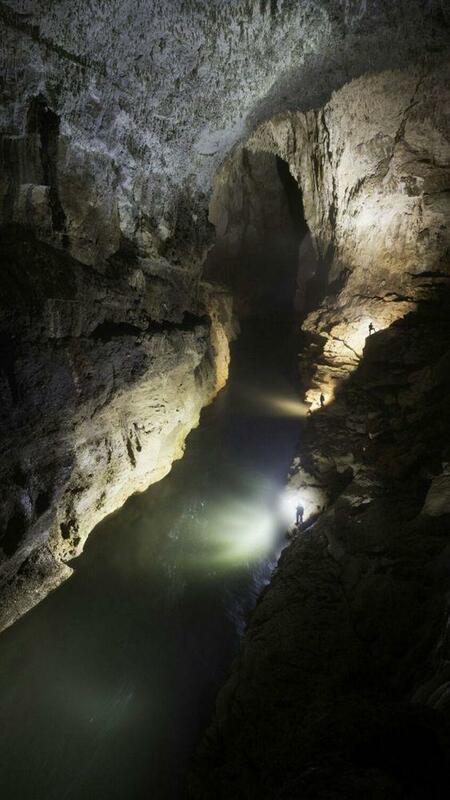 The research of this underground river turned out to be a very dangerous undertaking. Turned out that the river in many places takes the whole width of the cave. The power and amount of water were absolutely unusual and… just overwhelming. There is always torrential rain somewhere in Aouk basin, but very frequently – approximately once per three days this rain brings sudden surges of water in the river. Locals call it banjir, a kind of river tsunami. It is terrifying above the land and absolutely deadly – underground. Thus in 2016 the explorers barely escaped from it. Limestone cliffs in this area are formed from soft, crumbling coral limestone of fairly young – Miocene age. This created one more challenge – there were limited possibilities to use cliff-hanging equipment. Thus far (January 2019) have been explored some 6 kilometers of this system of giant caves. The entrance in the underground part is called Waykut. This fearsome portal into the underground is well known to local Mey Mare people. According to their beliefs, the deceased people start their way to the underground (called Worn’su) here as well, together with the river. The roar of Aouk stream in the underground is the voice of the ancestors. The resurgence of the river further below symbolizes the birth. Thus the death and birth are not too far and the souls of the deceased ones and the newborn are close together… or they are reborn too, just like the river? Who knows… But this mighty and beautiful natural monument fits well together with the legend. Explorers did not manage to go far in Waykut. The tunnel here is some 40 m wide and some 70 m tall – but the mighty stream (some 45 m3/s) takes the whole width and going with a boat in it is similar to suicide. 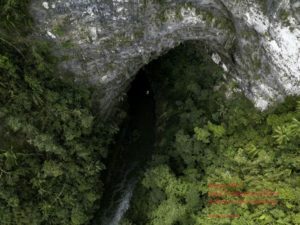 After some 1.7 kilometers long flow the stream reappears for a short time in a “window” – Keek sinkhole. Then it continues for some 1.9 kilometers under the ground – in this part it receives also a mighty tributary. All of this under the ground! Here to the south is located former river passage with an enormous collapse – current river can be reached through subterranean passages from this giant sinkhole – Hafasù Tiankeng. After these 1.9 kilometers, Aouk River reaches the next “window” – one more giant collapse named Kuom Tiankeng. Here it flows under the sky for some hundreds of meters and its discharge is somewhat bigger – approximately 50 m3/s. 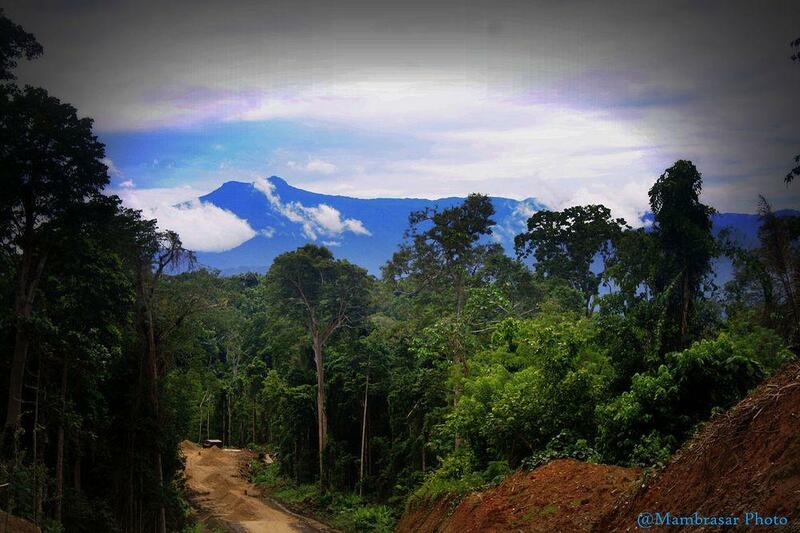 Then comes the final underground part – 300 m long Kuom passage. After this Aouk river flows under the sky, as most “normal” rivers, but many kilometers further come next underground passages (see Aouk-Kladuk Underground River). 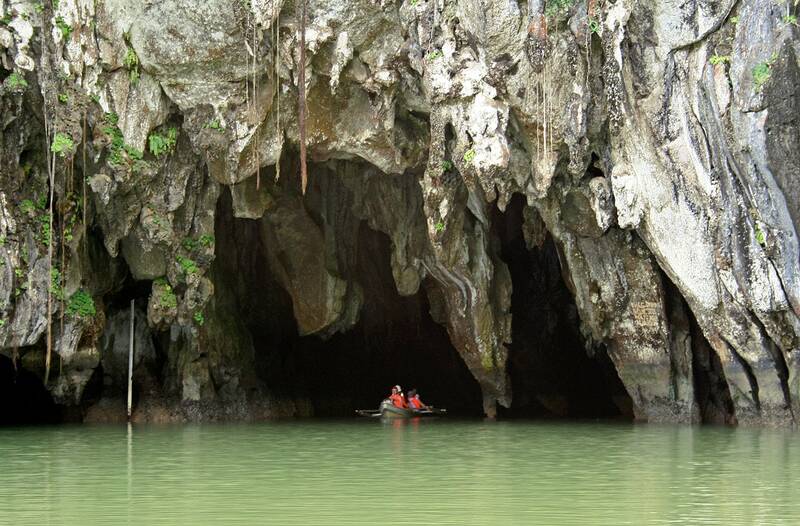 Aouk Underground River has similar size and even exceeds the world’s largest known cave rivers in Khoun Xe Cave (Laos) and Gebihe system (China). Thanks for this brief information about my village. I just seat with my family and they told me the stories of foreigner whose visited the cave couple of month Ago. When they informed me about this, I had though that the visit was about research purposes and exploring the cave or probably to understand the ecological structure of my land. I found the research are useful for natural conservation, further cave studies for water protections and eco-tourism development. Now I try to convince my communities and gauge them to established a management units for the areas. This will working along with the land tenure clarity and legal designation. Hope this will the research purposes and connect with other that have an interest with our beautiful nature. This is really a pleasure to see your comment here and I really wish you success in your noble mission. I am transferring your message to the manager of the expedition Mr. Andrea Benassi – as far as I know, they plan to return. Looking forward to be in touch with the expedition manager.